This item has been discontinued. Please choose from our other Kershaw Knives. The wide, thick blade of the Kershaw One Ton 1447 knife makes it ideal for your heavy duty tasks. The blade is 8Cr13MoV steel with dual studs. 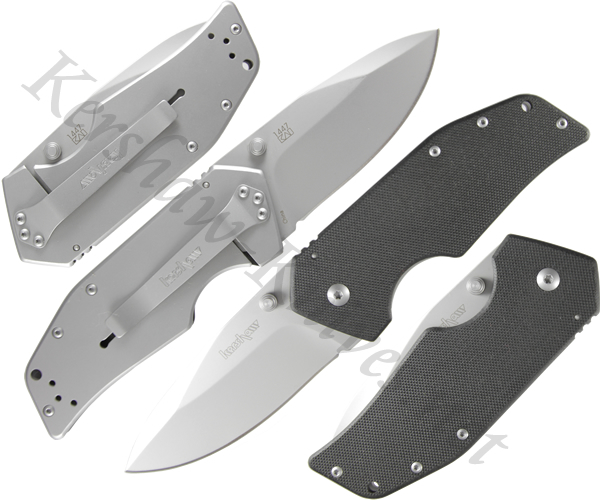 The handle is full frame stainless steel with a textured G-10 scale on the front. The back of the handle remains uncovered and houses the adjustable carrying clip. The One Ton 1447 is one big knife designed to take on tons of jobs. We accept all major credit cards, and Paypal. Kershaw-Knives.net is safe, secure, and trusted.